Available now from Universal Pumps , the new WaterBug rotor valve promotes intelligent irrigation in a time when households are experiencing rising costs in both water and electricity. The WaterBug rotor valve represents a low cost, highly reliable option for irrigating the garden and is powered by water supplied from rainwater tanks, grey water systems or even the garden tap. The WaterBug rotor irrigation valve controls the flow of tap water, rain water or grey water to irrigate the garden through either sprinkler or drip line irrigation systems. Its one valve, innovative system operates sequentially for up to six stations and offers improved performance by splitting flows and reducing operating rates. "For over 35 years there has been only one option available only for water rotation valves," says Universal Pumps' National Sales Manager Ashley Chaplyn. "The introduction of the Universal WaterBug will not only give consumers choice, it is also a fantastic add-on product to complement our award winning GreyFlow grey water diversion systems," she adds. The WaterBug rotor valve uses intelligent technology to control the flow of water out to sprinkler or drip lines, without the need for solenoid valves. The flow of water from the inlet is switched to each of the lines in a continuous sequential process. No electrical power or other mechanics are required. Coupled with water saving, sustainable products such as grey water diversion systems and rainwater tanks, the WaterBug rotor valve promotes a green garden all year around, even when water restrictions are in place. Furthermore, its even dispersal means the risk of soil nutrient loading is reduced. 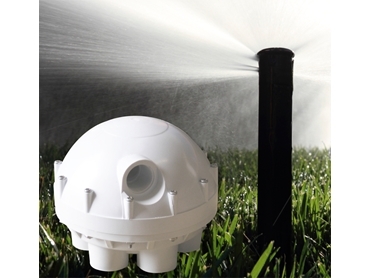 When used with irrigation systems, the WaterBug rotor valve can be set up with either a tap timer as a cost effective option or with automatic control systems, lowering the pipe size requirements and reducing infrastructure costs by up to 30%. The WaterBug can also be used for repairs or extensions. Now available from leading irrigation and pump retailers, the Universal WaterBug rotor valve will save you money while keeping gardens green.